iCloud can be used to back up your phone data. ITS recommends you turn this on. There are instructions on how to do this at the end of this document. ITS recommends that you setup either a Passcode or the Touch ID. You will set this up at the end of this document. This option uses your data plan to send information to Apple. Click Search on the bottom right hand side of the screen. Press I Agree on the screen. When the activation is complete, this screen will appear. Press the home button (circle on the bottom of your phone). Your mail will start to populate on the screen. Press the home button, scroll to the left, select the Settings icon. Select General until you see the screen on the next page. Scroll down until you see Mail, Contacts, Calendars and select that option. Change the default option No Limit to something else. Press the cloud icon(this is going to download it). You will be asked for your Apple ID password. The application listed as “Loading” is BBM. When it’s complete, the icon shows “BBM”. 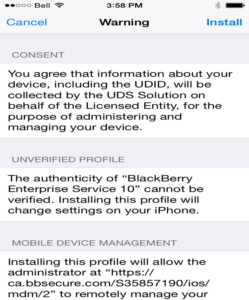 Use your Blackberry ID to sign in. Your BBM pin will appear on the next screen. Scroll left and select Settings. ITS requires that you lock your phone.